Today, when we consider where we might find items of historic value to our state, it seems logical to first approach our State organisations: the WA Museum, State Library of Western Australia, and State Records Office. Indeed, this is what J.S. Battye, then Librarian and General Secretary for our Public Library, Museum and Art Gallery of Western Australia, thought. He arranged for the historical and government archives to be collected and deposited in the Public Library. There were occasions when he was offered material that was pertinent to another state’s history, and then he referred the donor to that State’s institution. However, statehood is only ever an informal jurisdiction for collecting, and it seems that in one exchange (State Records Office AU WA S3326- cons1198 2000) Battye became aware of another collecting institution straying onto (what we would consider) our turf. So far, this letter is polite, if somewhat parochial (to use his own term) in its disregard for the right of a wider community to have access to its history. It is in ending his letter that the Librarian perhaps oversteps the mark. 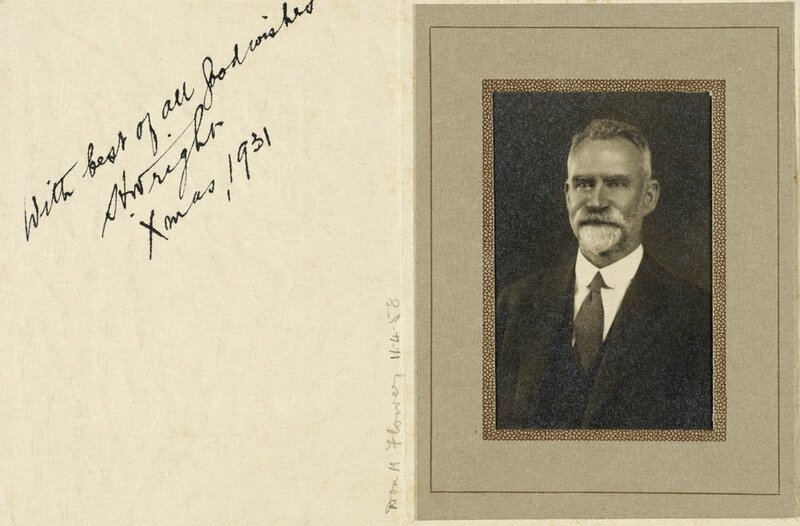 Portrait of Hugh Wright, 1931, Silver Gelatin print mounted, P1/2102, State Library of New South Wales, http://archival.sl.nsw.gov.au/Details/archive/110339789. His defence is that his letter was a personal one (he did not know that Stone was associated with the Public Library), and one that did not refer to the library (Perth) in any way. As it was not an official letter to the library, he did not break from that courteousness that directed any formal communication to an institution through the General Secretary and not the President or Chairman. This is an echo of a sentiment he expressed in an interview with the West Australian, published Tuesday 15th January 1907: ‘… the Mitchell collection of Australian literature, which was undoubtedly the best collection of its kind that was ever likely to be got together. Mr Battye thought it really should belong to the Commonwealth, and not any particular State, because it contained much original matter that could not be duplicated.’ It is not clear what the allusion to ‘recent events’ in the letter by Battye may refer. It is first raised by Wright in the phrase ‘the circumstances under which my letter was written’ (above). It may be Federation, which saw the decision to place the Nation’s capital in N.S.W. at a location that would come to be named Canberra (as a compromise to placing the capital in either Sydney or Melbourne, who wanted the honour for themselves). However, in 1917, the Parliament was still sitting in Melbourne. I also wonder if Battye may have been somewhat biased against Wright as a Sydneysider, as Battye was originally a Victorian before taking the position as Librarian in WA. Cartoon by Ben Strange, published in the Western Mail, Friday 4th January, 1918, in relation to the results of the second conscription plebiscite held in Australia on the 20th December 1917. Alternatively, the letters may allude to the events of World War One that at the time of this letter had been raging shy of three years. The atmosphere would have been particularly fraught with the current debates surrounding conscription. Australia had returned a ‘No’ vote on 28 October 1916 with serious consequences at Federal level with a split in the Labor party. Western Australia and New South Wales were poles apart on this issue, with W.A. strongly in favour, and N.S.W. against. The second plebiscite on this issue on 20 December 1917 was similarly returned. The polarity in the results inspired this cartoon, ‘East is East and West is West’ by Ben Strange, published in the Western Mail, Friday 4th Jan, 1918. These letters were written after the first plebiscite, Federal elections were to be held in May 1917, and the conscription debate still raged. There was also a burgeoning self-identity and worth associated with being ‘Australian’, rather than part of the British Empire. This was something Battye himself was aware of, and spoke publicly about (for example, see below). Awareness and appreciation that the Australian experience was a distinct history to be told was one that spurred War Correspondent Charles Bean to lobby for better management and retainment of our own war documentation, and this spurred the creation of an Australian War Records Section, the forerunner of the Australian War Memorial. Battye ends his correspondence by outlining the crux of the issue, that he considers that the State institution is the best depository for historical material regarding that State, regardless of the limited means available to the Perth institution. 'I am still of opinion that the Mitchell Library, whilst entitled to secure whatever it can by purchase, is not entitled to rake the other States in its own interests, and I am therefore of opinion that the Western Australian pioneer who forwarded you a manuscript journal relating to Western Australian matters, could have found a better place for it in the National institution of his own State … We have been collecting material of that character here for nearly twenty years past, and therefore do not require any incentive from outside to continue our labours. It is well known that the Mitchell Library has a significant collection of manuscript material pertaining to other states’ history. Hugh Wright is particularly recognised for his efforts towards securing Pioneer’s manuscripts, accredited with ‘persuading families that the Mitchell Library was a safe and proper repository for their treasures’ (Whitaker 2018:26). A guide to this material for Western Australia was created by Pam Matthews (Matthews 1981) and is available in the State Library of WA (The Mitchell Library’s collection can also be searched online (http://www.sl.nsw.gov.au/)). The Mitchell Library was able to be proactive in collecting part due to a generous endowment by its namesake, David Scott Mitchell, whose personal collection, collected over a period of forty years, was also bequeathed to the library. Their approach may also be understood through their history. The State Library of New South Wales, of which the Mitchell Library is part, is the oldest library in Australia, established in 1826. This is the same year that the settlement at King George’s Sound in Albany was ordered, some three years before the Swan River Colony, and over fifty years before Western Australia’s founding collecting institutions. Moreover, Sydney was one of the most successful colonial cities, which, together with Melbourne, would make it vie to be Australia’s capital city. These factors, and its early establishment within the Australian collecting sector would have contributed to it establishing a collection and collecting behaviour that reflected a nation’s history, rather than that of the State of New South Wales. This mentality can also be seen in the name of Sydney’s museum, the ‘Australian Museum’, and in Melbourne’s ‘National Gallery of Victoria’. The breadth of material donated by Mitchell and the endowment gave it more freedom to pursue this identity. Hugh Wright’s tenure as Librarian at The Mitchell Library definitely reflects an organisation that was creating a collection of national importance. Moreover, the Mitchell Library had an independent income with which to support its ambitious collecting policy, whereas many institutions at this time were suffering severe budget cuts due to the War, and these would continue well into the middle of the twentieth century thanks to the depression and World War Two. Hugh Wright perhaps saw it his duty to actively collect material that other institutions could not afford to acquire, or care for properly, due to their limited means (but his accusations of ‘parochial’ spirit perhaps suggests he just thought anyone outside of Sydney was not progressive in their appreciation of Australian history). The Mitchell Library Reading Room, with the Picture Gallery in the background, 1923. Digital image from Glass Photo-Negative, FL1016826, Collection ON 7, State Library of New South Wales http://archival.sl.nsw.gov.au/Details/archive/110321310. Battye and the Public Library, Museum and Art Gallery of Western Australia was in a very different position to Wright – as evidenced by Battye’s statement ‘although we have neither the facilities not the money’. The end of the nineteenth century saw Perth establish both a Public Library, and a Museum and Art Gallery, and these were joined in legislation in 1911. During this time period, the collections grew and plans were put in place for a striking complex, but from World War One the expansion of the Library and Museum were checked by lack of staff, budget, and delays in progressing with the new accommodations. Wright also had an advantage that the Mitchell Library was distinct from the Public Library, whereas Battye had a single budget to provide a Public Library and very little or no dedicated budget to the procurement and care of historical collections (some had been provided in 1903 for the collection and binding of historical government records, and an Archives Committee/Board was revived in 1923, and again in 1929, but provision never lasted until the appointment of an archivist in 1945). The differences between Perth’s financial situation and that of Eastern States’ institutions is something stressed in his interview with the West Australian newspaper, published 15th January, 1907. Battye was by no means inactive during this time, but the amount he was able to achieve through the library was definitely curtailed. Some eight years after these letters in a brief report to the premier regarding the ‘Historical Documents Committee’ (State Records Office AU WA S3326- cons1198 3329), Battye writes that the actions of the Committee are hampered due to no provision being made for expenses by the Government, and that there is no provision for fire proof storage of the collected material. His later involvement with the Western Australian Historical Society (founded 1926), and his own activity in publications and promoting Australian history through lectures and radio broadcasts, may have been a way in which he could push further outside of the constraints of his public office. This small exchange between Wright and Battye reflects many of the factors that has seen Western Australia’s collections not stay in Western Australia, something that is at the heart of what we are researching with Collecting the West. In this instance, the proactive collecting activity of The Mitchell Library ruffled some feathers, perhaps not least because Battye knew that he did not have the same tools at his disposal for active collecting as Wright. For me, this correspondence exchange provided an amusing distraction while I was in the State Records Office chasing the history of collecting photographs in our WA institutions, and how we document them. ‘About Public Libraries. Interview with Mr. J.S. Battye. His Impressions of Eastern States Institutions.’ (1907, January 15) The West Australian, Perth: 3. <http://nla.gov.au/nla.news-article25693750> accessed Mar 12, 2018. ‘East is East and West is West [Illustration].’ (1918, January 4). Western Mail (Illustrated Section), Perth: 7. <http://nla.gov.au/nla.news-page3492648> accessed Mar 12, 2018. ‘National Sentiment. Australia’s Great Need.’ (1913, November 17) The West Australian, Perth: 4. <http://nla.gov.au/nla.news-article26890403> accessed Retrieved Mar 12, 2018. Mathews, Pam (1981). A guide to manuscript material relating to Western Australia held in the Mitchell Library, Sydney <http://catalogue.slwa.wa.gov.au/record=b1246468~S1> accessed Mar 12, 2018. Whitaker, Anne-Maree (2018). ‘The Librarian as Historian’: Hugh Wright, C. H. Bertie and Their Circle, Journal of the Australian Library and Information Association 67.1: 20-30. <https://doi.org/10.1080/24750158.2017.1404229> accessed Mar 12, 2018. Thanks to the State Records Office for their continued help in the archives, to Jane Lydon and Jenny Gregory for their helpful comments, and to Bobbie Oliver for alerting me to Ben Strange’s marvellous cartoon and discussing with me the importance of the conscription debate at the time.